Precision sheet metal manufacturer KMF has invested over £800,000 in new machinery with the support of Lloyds TSB Commercial Finance. EPM Technology, which currently employs 75 at its site in Draycott, has been awarded a £4.75 million loan through the DEGF which secured funding from the Government’s Regional Growth Fund. Birmingham-based Dunlop Aircraft Tyres has secured a £1.5 million government grant to develop and test next-generation aircraft tyres that will be lighter and more robust. The three-year project, which is being run in collaboration with Airbus, will see the world’s only specialist aircraft tyre manufacturer and retreader focus on developing main-wheel radial tyres designed for current and future versions of the A320 family of aircraft. Cullum are thrilled to be sponsoring this year’s inaugural “School of the Year” award in the Derbyshire’s Best Business Awards 2103. The winner will be announced at the Awards Dinner being held at the Roundhouse on 27th September. Delcam’s CADCAM software is at the heart of a new hybrid repair machine launched by Hamuel Maschinenbau at the EMO exhibition in Hannover. The significance of the new machine was recognised with an EMO Award from industry magazine MM Maschinenmarkt. Birmingham-based Dunlop Aircraft Tyres has landed a long-term contract to provide new and retreaded tyres to Czech Republic carrier Travel Service Airlines. The tyres will support Travel Service Airlines’ fleet of 23 Boeing 737 Next Generation aircraft, as well as four B737NGs operating for its low-cost subsidiary SmartWings. 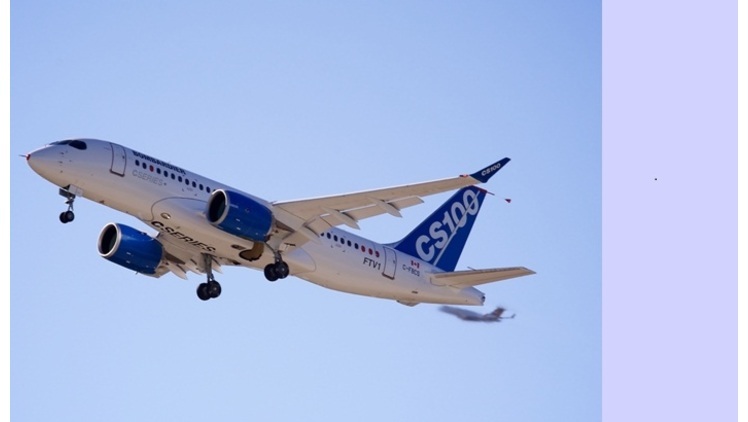 Midlands aerospace has welcomed the first flight of Bombardier’s innovative super-efficient CSeries narrowbody airliner, the Canadian company’s 110-140 seat challenger to small airliners offered by Airbus and Boeing. Companies from across the region are contributing cutting-edge technologies to enhance the performance of the aircraft and that of its Pratt & Whitney pathbreaking PurePower® PW1500G “geared turbofan” engines. In only five years, Derby composites firm Pentaxia has gone from a standing start to employing dozens of people and a seven-figure turnover. It is a high-growth, hi-tech manufacturing operation working in aerospace, motorsport and the oil and gas industry.